The type of file that you can create depends on the template or templates that your site owner or administrator has associated with the library. If you want to create an additional type of file in your library, contact your administrator or site owner. Note: To upload existing files to a document library, see Upload a folder or files to a document library. Go to the location in the document library where you want to create a new file. If you need to create a new folder to store the new file, see Create a folder in a document library. On the main document library menu, click New and then select the type of file you want to create. Note: The file type selection may vary. 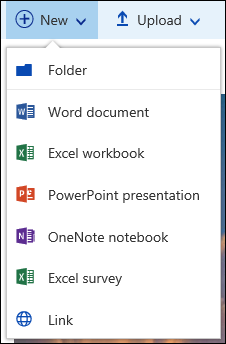 Note: To create a new folder, see Create a folder in a document library. Note: To add a link in a document library, see Add a link in a document library. Add the text and other items that you want to your file. Your new file is automatically saved to the document library and will appear in the list of files. Click the back arrow in your browser to return to the document library when done. If you do not see your files in the library, refresh the browser. If you want to rename your document (it will have a generic name), click Show more next to the document, and then click Rename. Depending on how your library is set up, you may be prompted for additional information about the file when you save it. For example, you may be asked to choose the content type of the file or enter more details about the file. If you are saving a file to a library that requires files to be checked out, the file is initially checked out to you. You must check in the file before other people can edit it. If content approval is required for your library, your file may need to be approved before it is visible to everyone who has permission to view the files in the library.